Inspired by the sheen of the big city streets and intersections illuminated at night, the Crossroads suspension piece by Tech Lighting is truly one of kind. 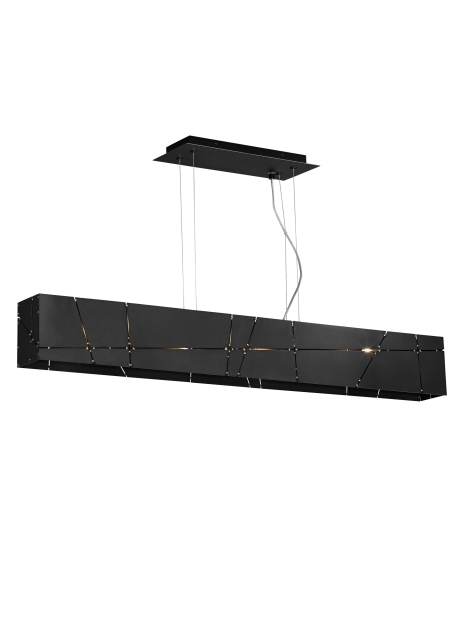 This raw style suspension is composed of sheets of raw steel protected with a clear lacquer coat and accented by brass spot welding at the joints. This suspension fixture features a purposefully imperfect, rugged, industrial design that will add a bold modern appeal to any space. Scaling at 46” in length the Crossroads is ideal for dining room lighting, foyer lighting and home office lighting. Your choice of fully dimmable integrated LED lamping ships with the Crossroads to save you both time and money. Composed of sheets of raw steel protected with a clear lacquer coat and accented by brass spot welding at the joints, this suspension fixture has a purposefully imperfect, rugged, industrial design. Includes four 120 volt, 40 watt G9 halogen bi-pin lamps or two 20 watt, field-replaceable LED strips (2000 lumens, 3000K). Halogen may also be lamped with four 120 volt, 60 watt G9 halogen bi-pin lamps (not included). Ships with 12 feet of field-cuttable cord and twelve feet of aircraft cable. Incandescent version dimmable with standard incandescent dimmer. LED dimmable with low-voltage electronic dimmer.